I generally don’t review web apps, but this one is too good not to share with others who are currently freezing their asses off in Chicago! Chicago CTA Bus Tracker is a web app that delivers real-time bus location info that comes straight from the Chicago Transit Authority’s very own bus tracking system. Choose your bus line, choose your direction, choose your stop, and before you know it you’re looking at a map of the nearest bus’s location and ETA. Just point your iPhone’s Safari browser to cta.growinglogic.com and you’re all set. 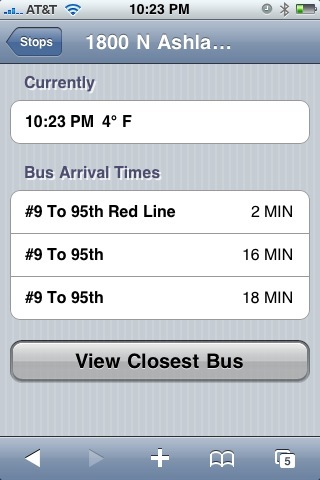 I don’t really ride the bus very much so I haven’t tried to confirm the tracker’s accuracy… plus I’m worried that I might literally drop dead if I step outside in this weather… but Chicago CTA Bus Tracker is free and the info is coming straight from the source so you’re really not gonna do any better than this. Tomorrow’s HIGH temperature in Chicago is expected to hit -3°F… yeah, -3 frakkin’ degrees (that’s -19°C to the rest of the world)… so not only will Michael Simmons’ iPhone web app save you some aggravation, there’s a chance it may save you from dying of hypothermia as well. Thanks to our friends at Nerdy by Nature.org for finding this web app gem. If you use a similar (and hopefully free) app that provides real-time public transit tracking in a different city, please feel free to post it in the comments! I know there are some in the iTunes App Store but web apps are harder to locate.